Honk if you follow us on Facebook! In the past three days I've heard the term "Bee Sting Pizza" mentioned about a hundred times. Up until Sunday I'd never heard it mentioned at all. Most of the Google search results for "Bee Sting Pizza" (at least at the moment) seem to be from May 6th through May 9th. All these articles seem to reference that this phenomenon comes from Roberta's Pizza in Brooklyn. 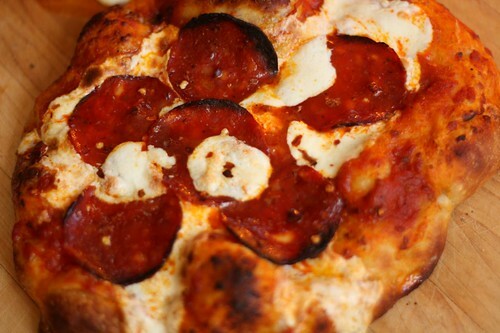 The pizza is nothing too crazy: it seems to be a pepperoni pizza (though some say it uses a spicy sopresatta) with mozzarella, honey, and red pepper flakes. I made my own version of the pizza tonight since I had all the ingredients lying around to make it pretty easy. I used a spicy genoa salami in lieu of the soppresata/pepperoni. I drizzled it with a little honey, sprinkled some red pepper flakes on the top and threw it in the oven. It turns out that there's a good reason that this pizza has been getting a lot of attention in the last week. It's fantastic! It's incredible that simply adding some honey (the bee) and chili pepper flakes (the sting) can totally change the entire taste of a pizza but it really can. I highly recommend that anyone reading this make this pizza or run out to Roberta's and get one for yourself. I'm assuming that the one at Roberta's is much better than mine and mine was pretty good. 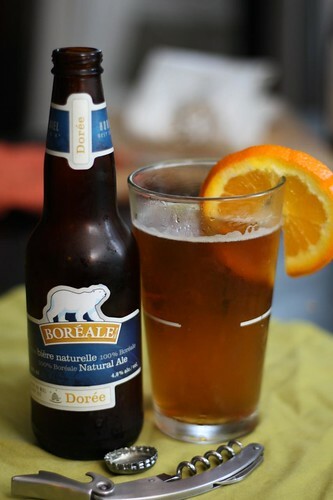 Too keep with the honey theme I cracked open a Boréale Dorée, a beer fermented with honey. I garnished it with an orange slice even though that's not a generally accepted garnish for a honey beer. But I'm not one for generally accepted practices. People who are into only following generally accepted principles of cooking do not come up with pepperoni pizza with honey on it. And, therefore, they are fools.